In the battle of Kraków vs. Warsaw in terms of vibe + atmosphere, Warsaw wins out (an unpopular choice, but that’s how I felt!). When the two are fighting it out for where there’s better food, though … the winner isn’t as clear-cut. I think that’s because Poland, overall, has amazing food wherever you go. 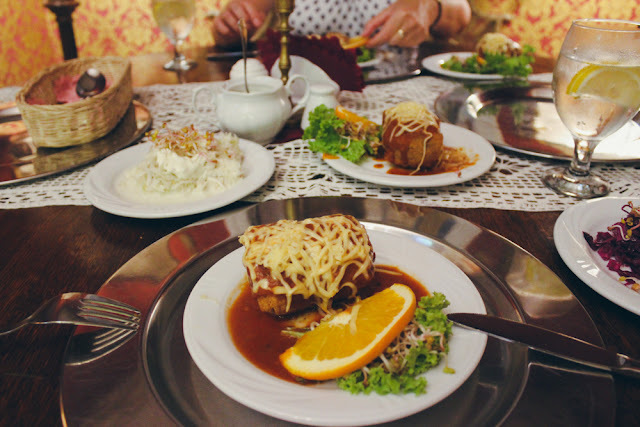 Below are the places I ate at & enjoyed while in Kraków. The name of this restaurant roughly translates to “Grandma’s Kitchen.” Wooed by the hopes of home cooked food, Mom and I came here for a quick bite to eat. Our only mistake is that we ordered way, way, way too much food. We assumed that the croquettes were going to be small, so we each ordered an extra one for our meal. When they arrived, Mom and I just burst out laughing. It was a massive portion. Whoops. Don’t order extra when you’re here! The barszcz and salads that came with the croquette were phenomenal. Fresh and delicious. 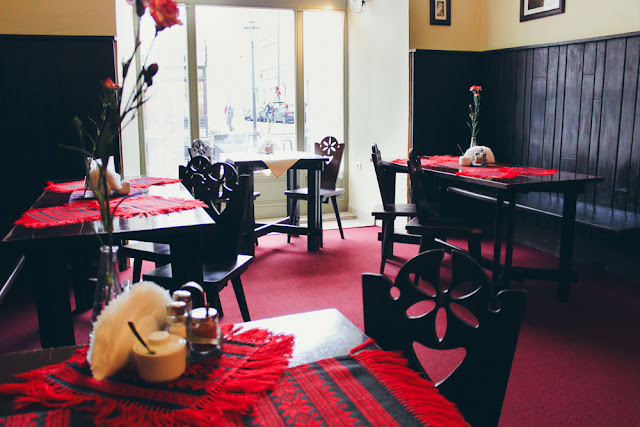 According to Mom, this restaurant has been a staple in Kraków for decades. My grandma always came here with her friends. 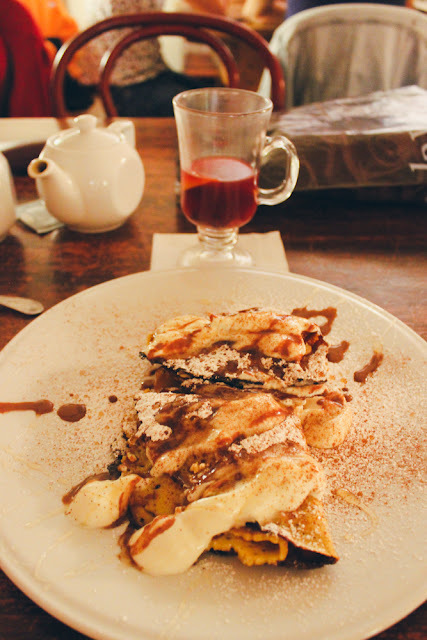 Serving hearty and flavourful Hungarian dishes, we both got “Placki po Węgiersku”, Hungarian Pancakes. 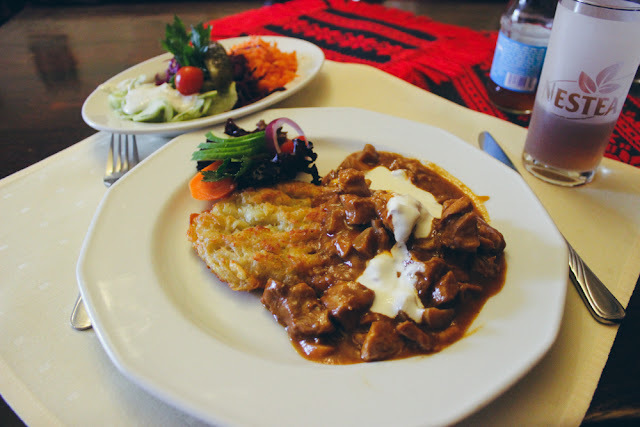 They’re crispy potato pancakes served with meat and sauce on top, and probably one of my favourite dishes in the world. Here, they’re served with a variety of cold salads, and of course, sour cream on top. The restaurants in and around the main square are known for being quite pricey and lacking in food quality. My cousin, who’s lived in Kraków for quite some time now, brought us to Sukiennice, her go-to place in the Main Square. 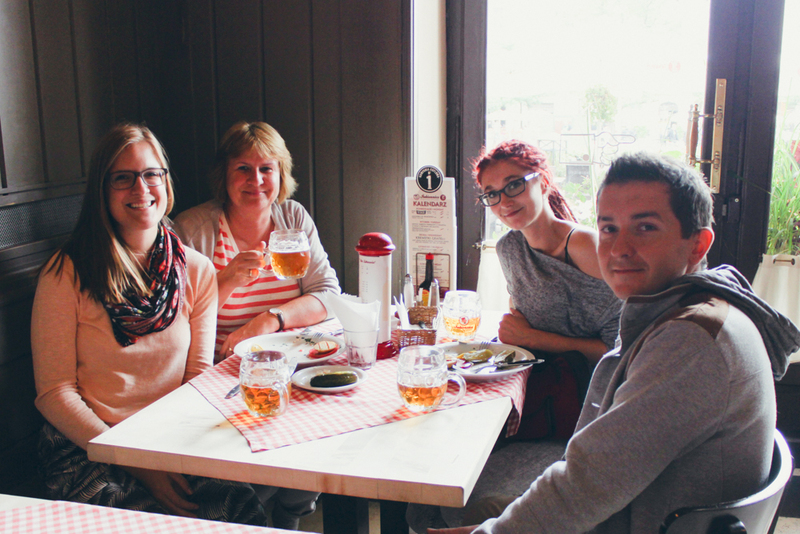 We came here for the beer and fried oscypek, which is a traditional cheese made in Southern Poland. It’s not everybody’s taste, but I’m obsessed, and even ended up bringing 3kg back home with me. The restaurant kindly and unexpectedly gave us four free shots of fruit vodka. Four FREE shots. Totally not the norm in North America, but judging by the unsurprised looks of my cousin and her boyfriend, it must happen more often in Poland. Note: move here soon. 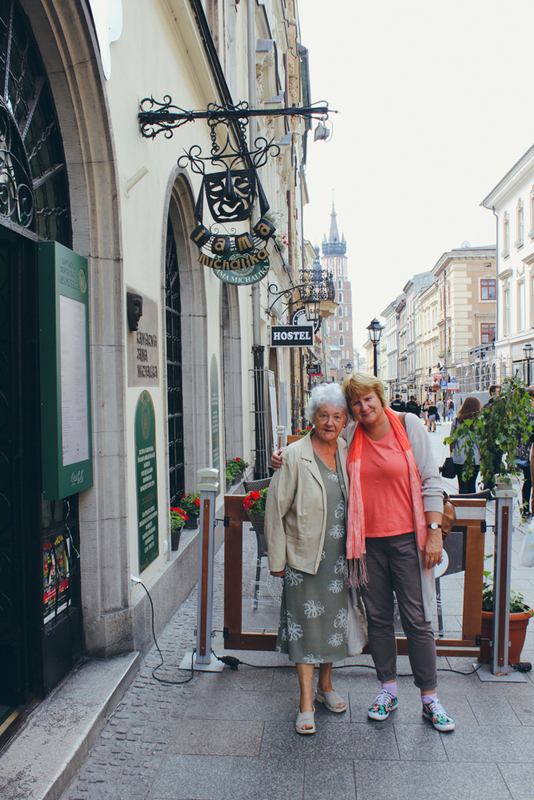 Mom and I would have loved more time to explore the old Jewish district of Kraków, Kazimierz. When we met up with one of my mom’s friends at Café Młynek, the neighbourhood didn’t look as busy and alive as I had assumed, but maybe that’s because we weren’t in the right area. I’ll definitely have to devote more time to it on my next trip. 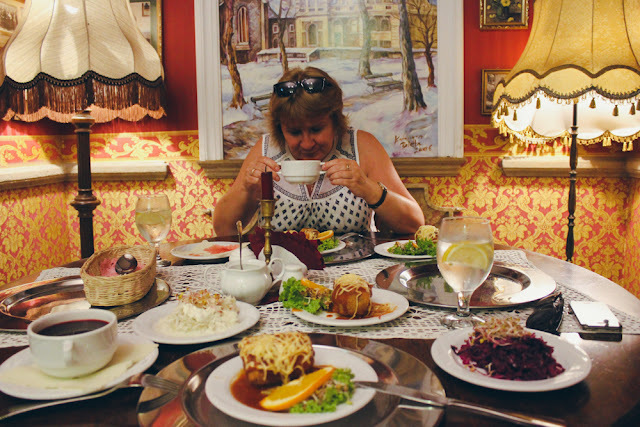 Either way, Café Młynek did not disappoint. 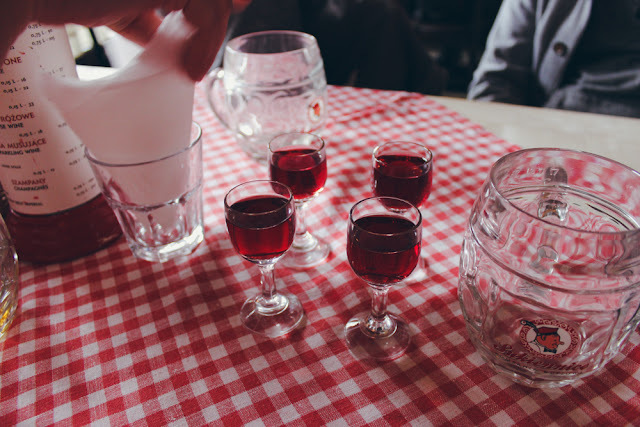 I ordered crepes and mulled wine, which was very strong but very delicious. 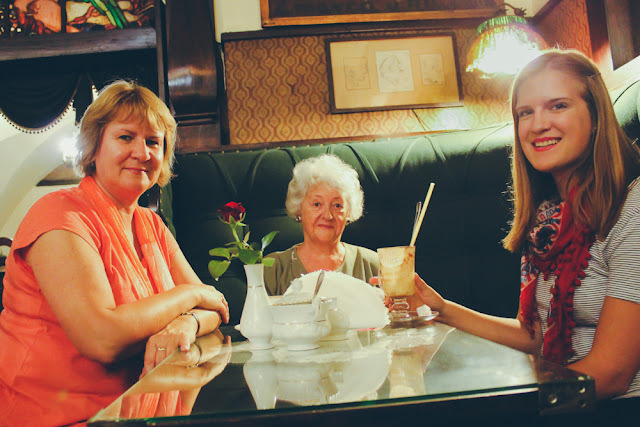 Another Kraków classic, Mom and I met up with my grandma’s best friend here before spending the day touring art galleries & museums with her. 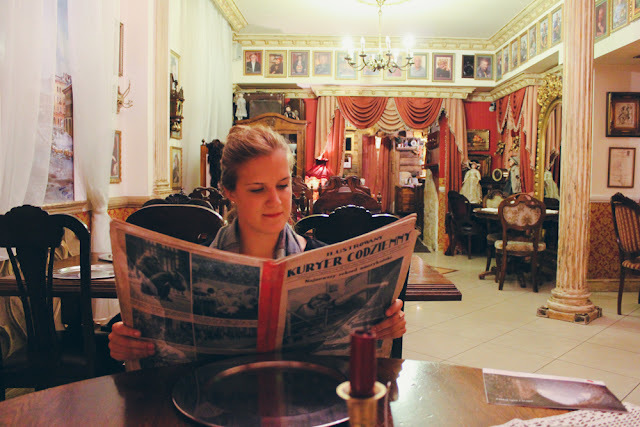 Opened in 1895, the café is one of the oldest in Kraków, and the décor from 1908 still adorns the interior. 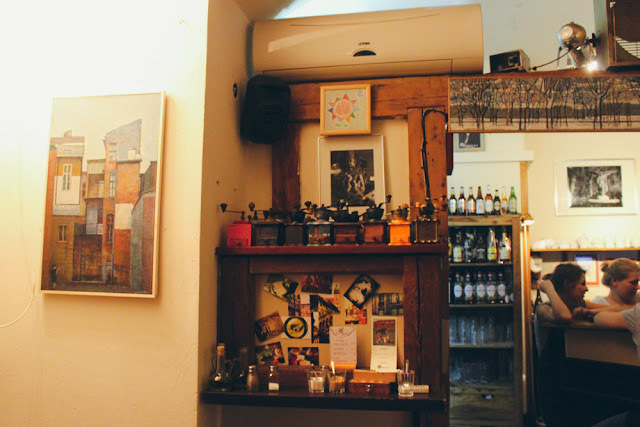 Although it looks a little dated now, back in its glory years, it was the place for bohemians and artists to get together and discuss their work. Plays, cabarets, and various other performances were staged at the café. There weren’t any performances going on in the morning, so I just ordered a whipped hot chocolate which came in a beautiful large glass. We were only in Kraków for three days, so I’m sure I’ve missed many “go-to” restaurants in the city. The above is where my Mom and I managed to visit, and they’re all places we enjoyed very much. Happy eating!